Jewelry artisan Poungtong crafts this beautiful necklace by hand. 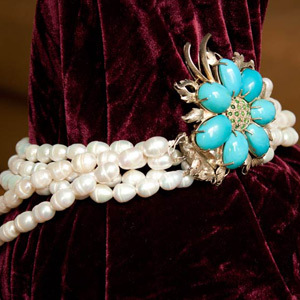 She sets the turquoise and green garnets on a silver box clasp shaped like a flower. 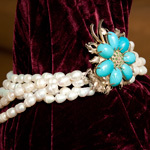 She completes the design by attaching five strings of pearls to the flower box. This necklace is designed to be worn with the flower box behind the neck. Materials: Turquoise, green garnet, cultured freshwater pearls and sterling (.925) silver.